What Is A Jounce Bumper? Commonly known as a “bump stop,” the jounce bumper was initially used to prevent the abrupt bottoming-out of the suspension under full compression. Over the years this has changed and the jounce bumper has been integrated into the vehicle’s suspension design. 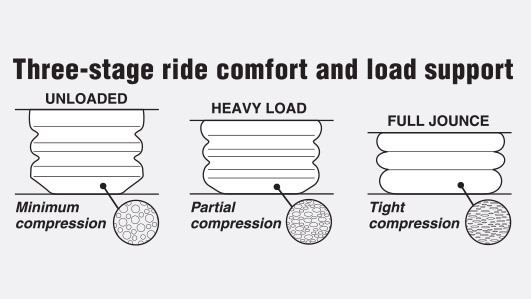 Commonly manufactured from closed-cell foam, the jounce bumper absorbs impact and dampens noise, vibration and harshness (NVH) by preventing the articulated suspension components from fully compacting during shock impacts caused by heavy loads, potholes, curbs or objects in the road. The modern jounce bumper also acts as a progressive compression spring under loads approaching full compression, thereby offering a smoother ride and improved handling over a wide range of driving and load conditions. 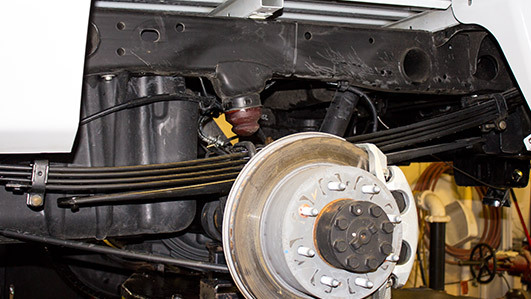 On vehicles equipped with leaf spring suspensions (fitted to many full-size trucks) the bump-stop is typically mounted between the axle tube and the chassis side rail. 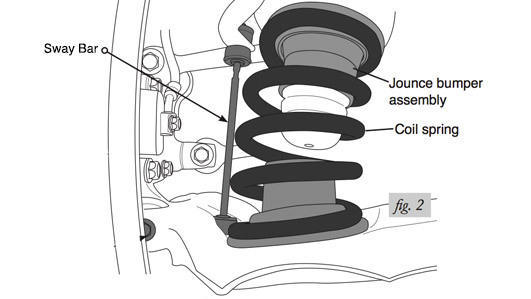 On vehicles equipped with coil spring suspensions (fitted to most cars, SUVs and some trucks) the jounce bumper is typically mounted on the bottom of the frame at the top of the coil spring. Air Lift’s new LoadLifter 5000 ULTIMATE air spring kits now include jounce bumpers inside each air bag, providing the ultimate solution for towing and hauling heavy loads. Made from closed-cell urethane foam, the jounce bumper inside LoadLifter 5000 ULTIMATE kits provide a factory-like cushion that absorbs shocks and controls extreme suspension travel in heavily laden vehicles. Not merely a bump-stop, these integrated jounce bumpers offer three stage compression that loosely simulate variable rate mechanical springs. Including an internal jounce bumper in the air spring not only simplifies fitment and improves ride, it also enhances the maintenance-free aspect of air helper springs.